Nesting has slowed quite a bit during the past week, with several nights of seeing no turtles. We did see Sabrina, Coco, Esmerelda, Seri, Rica, Rapunzel and Phyllis. Unfortunately Sabrina and Phyllis could not get comfortable on the beach and didn’t end up nesting. They dug several egg chambers but abandoned them. This time of year we do see turtles do this more often – they are nearing the end of their season, and may not have many eggs left inside – so their timing can be a bit off. Both turtles may come back another night to try again. We did have one unobserved nest on Saturday night, the turtle was likely on the beach during the early morning hours around dawn. 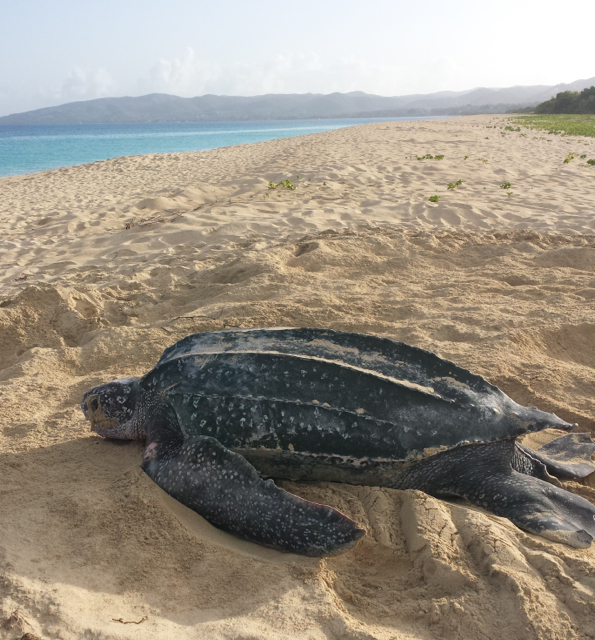 The track looked big so it may have been Phyllis – she’s our biggest and our oldest turtle nesting this season. She was first tagged in 1999. With nesting season winding down, we are spending more time with our nests that are due to hatch. About ten days before nests are due, we locate them using our triangulation measurements from earlier in the season and then observe them carefully each night for hatching. We are on the beach to protect the emerging hatchlings from patrolling frigate birds and night herons (who love to get hatchlings). We carefully observe the hatching event – and then protect the hatchlings as they make their way to the water. If you’d like to help us by sponsoring a nest, you can do so for a $50 donation to the The Ocean Foundation. We will mail you a project sticker, and the information about your nest – who it belonged to, the date it was laid, the date it hatched and how many little hatchlings made their way out! Thank you so much for your support!